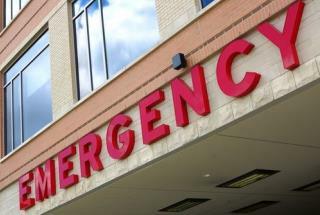 (Newser) – Backers of ObamaCare have said it would reduce the number of visits to emergency rooms, the Wall Street Journal notes, but in fact, a poll of ER doctors finds that number has been climbing. "Visits are going up despite the (Affordable Care Act), and in a lot of cases because of it," a spokesman for the American College of Emergency Physicians tells the Journal. The findings come from a March poll of 2,098 doctors, three-quarters of whom said they'd seen ER visits increase since January 2014. Last year, less than half of doctors polled noted an increase in the number of visits. I had a stroke last year. Went to the small hospital that gets you stable to pass you on to the main hospital. 50 miles away. Got to the main hospital. Found ER as full as the first one. Later in my room I ask why ER was so full. Was told that ever since the ACA came in. The ERs in town have all been full. More and more people coming in. I am also on Medicare part A. Can't afford part B at 496.00 a month plus a 6000.00 deductible. So I have no insurance thanks to Obamacare. this article is 100% factual. I know someone on Medicaid who has the exact same problems. for months, she couldn't find a dr. to treat her and finally did 1 month ago. she will be seen in SEPTEMBER! I told her if the problem gets worse, go to the ER, just as everyone else is STILL doing, despite Obama saying the ACA was to PREVENT ER visits. HA! !